So, normally I post articles related to writing, science fiction, fantasy, or heavy metal, but today I want to write about something a little different. Today’s post is about why we work, the value of our work, and the implications of technology on work in the future. Most people, or at least those with a cursory knowledge of economics, are familiar with the name John Maynard Keynes. He was a British economist who revolutionized modern theories of macroeconomics, and he applied his theories to make predictions about world economies and economic trends in general. One of his rather famous predictions was that future societies would have dramatically reduced workweeks. In 1930, he predicted that within 100 years, the average workweek would drop to only 15 hours. He theorized that with modest global growth – about 2% a year – our ability to produce goods and render services would increase eightfold, and in a world with so much wealth, we would naturally choose to increase our leisure time rather than simply accumulate additional wealth. While we may not have exhausted the full hundred years of his prediction, we’re starting to get pretty close, and, contrary to Keynes’ prediction, the statistics indicate that we’re working as much as ever, if not more. In the US, the average workweek for a full time employee is about 42 hours. In Europe, despite numerous attempts to decrease working hours, the average workweek is anywhere from 36 to 42 hours, depending on the country. In Asia, many countries have workweeks that average 48 hours or more. Now, it’s not like we haven’t made any improvements to work hours over the years. In the early years of the industrial revolution, before modern labor laws were enacted, 60 hour workweeks were common. So clearly we are working less than we could be. But 40 hours a week is still a far cry from the 15 that Keynes predicted. And, as it turns out, Keynes underestimated just how much our economies would grow. In a 2000 study, Eric Rauch showed that based on productivity increases since 1950, the average worker would need to work a mere 11 hours (11!) to produce as much as a worker in 1950 did. Surely the trend has continued since the year 2000. Now, a sub-10 hour workweek should yield the same level of productivity as a 40 hour workweek in 1950. So why do we still work so much? Well, the usual argument is that our standard of living now is much better than the one available to us in 1950, and so more work is needed to supply that standard. But surveys have shown that people in countries with the standard of living that the US enjoyed in the 1950s are no less satisfied than today’s Americans. Indeed, many studies show that wealth increases people’s happiness only up to a level where one’s basic needs are met. So again I ask, why do we work so much? Well, I’m not entirely sure why, but it seems pretty clear that as a species, we have decided that growth is good and that more is always better. While individuals may make different decisions, societies as a whole have stayed true to these mantras for basically all of recorded human history. Stuff is good, and more stuff is better. Heck, humans invented permanent houses as a means to store our stuff, and we invited writing as a means to keep track of all of our stuff. But how much stuff do we need? Let’s keep this question in mind and take a brief aside to discuss the history of agriculture, which also happens to be a history of the value of human labor. For the vast majority of human history, agricultural yield was calculated as seeds harvested per seed sown. At around the time of Christ, wheat yields might have been about 4 to 1, depending on soil conditions. This is not a good number. Modern wheat yields, by this measure, are maybe 100 to 1. Corn yields are perhaps 1000 to 1. But even these numbers don’t fully encompass the strides we’ve made. Wheat seeds and corn plants are much larger, heartier, and more nutritious than the varieties that were around 2000 years ago. Now, and for the last 500 years or so, we measure agricultural yield as total production per unit of land area. Historical data is hard to come by but recent data from say, 1950, is easy to find. As you might imagine, productivity increases mirror those in the workforce in general. From the year 1950 to the year 2000, wheat yields increased from 750 kg per hectare to 2750 kg per hectare. Corn yields grew from about 40 to over 150 bushels per acre. Milk production per cow more than tripled. Those numbers are impressive, but given that the comparison between ancient yields and modern yields is a bit of an apples to oranges comparison, consider this: In ancient Greece, roughly 80% of all people worked in the agricultural industry. In the US in 1940, that number was roughly 18.5%. Today? Farmers account for about 1.5% of the American labor force. That’s amazing! It’s utterly fantastic that a mere 1.5% of our population can now produce the food necessary for the rest. How did we do it? In large part, through improvements in technology. Ancient man made improvements in agricultural yields in large part through the slow process of unnatural selection but also by making strides in technology. The invention of the plow alone lead to an agricultural revolution. But this brings me to my last point. What do technological advances mean for the future of work? Will they help us work less, brining about Keynes prediction? Or will something else result? Let’s look at this info graphic from the US census bureau. 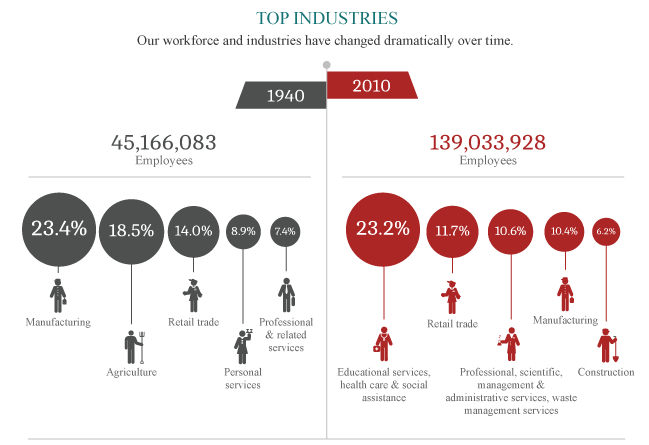 It shows the top industries in the United States in 1940 versus today. A few things are immediately obvious. As I mentioned before, the number of people working in agricultural jobs has plummeted. We’re just much more efficient at producing food than we used to be. Manufacturing jobs have also evaporated. Why? Well, in part we shipped our manufacturing jobs overseas to other countries, but we’ve also made great strides in mechanizing assembly lines. Think about it. In 1940, cars were largely built by people. People in assembly lines, to be fair, but people nonetheless. Now? Some people are still involved, but machines (robots) do much of the work. Fewer humans are needed in the process from start to finish. You could say the same thing about how we manufacture virtually anything that is mass produced, from children’s toys to plastic jugs. Again, this is a good thing for society as a whole. Greater efficiency is good. We can create more wealth with less actual work. But you could certainly argue that greater efficiency was bad for the people who lost their jobs as a result. No matter. Humans are inventive. We simply created new jobs for people to do. We’ve done this every time human jobs have been made obsolete by technology. Something has been happening over the last 30 years or so, something that has just started to reach a tipping point. Computers are fantastic at doing simple, repetitive tasks, just like robots in assembly lines. But as we’ve made computers faster and faster, given them greater and greater amounts of processing power, we’ve increased their capabilities. We’ve also made great strides in how we write software, and we continue our trek towards creating systems with artificial intelligence. Computers are starting to become quite good at much more complex tasks, and as a result, they’re putting us all out of work. Take, for example, a legal aid. Thirty years ago, legal aids would be tasked with finding information on prior cases, and so they would head down to the archives and browse and read and collect information. Now? Everything is digitized and searchable. One aid can do the work of perhaps five. Computers did not eliminate the legal aid job entirely, but they made it easier, to the point where fewer people are needed to do the work. In some fields, computers are about to eliminate jobs entirely. We have self driving cars now. There are still legal ramifications to be sorted out with letting computers control cars, but within 10 or 20 years, every single truck driver, cab driver, limo driver, and most delivery men will have their jobs eliminated by computers. You might think this is just one example, that most jobs are safe, but as computers become more advanced, every job will be at risk. I have a Ph.D. in engineering, and I’m employed as a postdoctoral research at a national lab. This is a job that requires a high level of training and expertise, and I can safely say that, with the proper equipment and software, roughly 75% of my job could be replaced by machines and computers within the next 5 to 10 years. A good chunk of it could be replaced right now if we had the money to buy the proper equipment. Again, my job won’t be made completely obsolete by computers, but computers will put many of me and my colleagues out of work. As a society, we’ve always assumed that people who are unemployed are lazy. If they wanted a job, they could just go get one, we say. But what if this isn’t true anymore? What if people can’t find work because there just aren’t that many jobs to be had? We’ve done such a good job at increasing our efficiency at work, that there’s just not enough work to go around. You can imagine how this might become a problem. We have a society in which we value people’s worth based on their work. You get paid not by how much you produce (for the most part), but by how many hours you work. If people can’t get enough hours of work, regardless of how efficient computers and machines have made those work hours, they will not make enough money to buy food and they will starve, even though 1% of our workforce can produce enough food to feed the entire population. So what is the answer? What can we do to make sure that the vast amount of human wealth generated by technology gets distributed in a way that is both fair to those who developed and implemented said technology and also doesn’t punish those who were negatively impacted by the technology? I have no idea. Wealth redistribution by governments is a popular answer. Some countries in Europe have proposed paying people a minimum salary, enough for people to survive, whether they work or not. I have no idea if this would work in those countries, but it won’t work in the US, and not simply because of political will. The US is too diverse, ethnically, racially, culturally, religiously, and socioeconomically for people to agree to something like that. Besides, despite current technological advances, there’s still plenty of onerous, low-paying jobs that won’t be replaced by robots and computers any time soon. We don’t have robots that can pick strawberries, clean bathrooms, or take care of the elderly. These jobs need to be done. If you pay people regardless of whether they work or not, then who will do the onerous jobs? No one. Then again, there’s not enough of these jobs to employ an entire workforce. So what will all the other people do? As I see it, we are rapidly approaching a point where there will be substantially fewer jobs than people available to do them, and this will put the stability of our societies at risk. I really don’t know how we’ll deal with it. Hopefully, we’ll figure something out. As for me? Well, I hope to make money writing. But don’t think that the writing profession, just because it’s a creative endeavor, won’t get replaced by computers eventually. Who’s to say that a commuter won’t one day be able to write a grand, epic novel? I just hope it doesn’t happen within my lifetime. Image credit: Featured image by David Wright (CC BY 2.0), via Flickr.